In the order confirmation you can find more information. Once your order is activated we will send you an email with your login details. If you pay online (e.g. credit card, PayPal) your order will be activated automatically. You don't have to do anything. Within 5 minutes after you have completed your order, you will receive a confirmation email and an email with a link to create a password. Note: If you don't receive the password email, this might mean that further checks are required. In that case you need to use one of the other methods to activate the order. If you have chosen to pay by bank transfer, you need to activate your order manually with an activation code that is sent by SMS. The code will be sent to the mobile number you entered during the order procedure. Click Go to activation page. Type in the 4-digit code you received by SMS. Tip: Didn't get the SMS code? Try resending it to a different number. Click the link on the activation page. 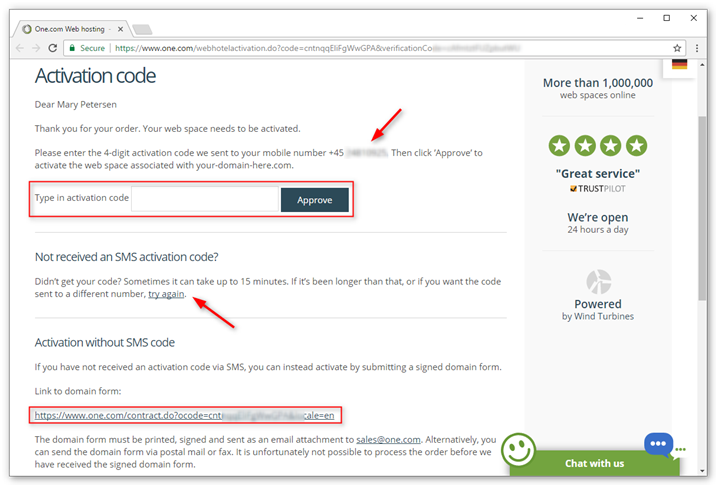 If you haven't received the activation code, you need to activate your order by sending us a signed domain form. You can find a link to the form on the activation page. Make a scan or digital photo of the form. Send the form to sales@one.com.